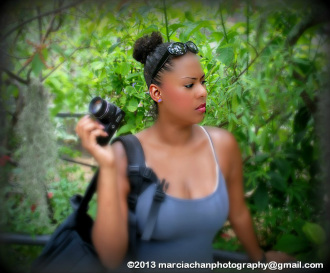 "Me, Myself and Marcia: A never ending love affair with Photography"
I fell in love with photography when I was 16yrs old. In high school, I had to have an art or music class as part of my school curriculum. I couldn't play a musical instrument (trust me I tried, and I sucked big time) Since I draw like a 2yr old, therefore drawing was not an option either. Photography was my last and only choice. My photography teacher, Ms. Adrian Wander immediately recognized my natural artistic eye. She encouraged me to study photography in college. In 1998, I earned my degree in photojournalism and commercial photography. Though my camera, photography became my talent and my art. Then after, it turned into my passion, my therapy, and my sanctuary. I felt like photography captured me, seduced me, and made me fall in love with it. I find harmony within myself because of photography. It teaches me to be patient, to think openly, and innovatively. I am continually learning about myself through photography.